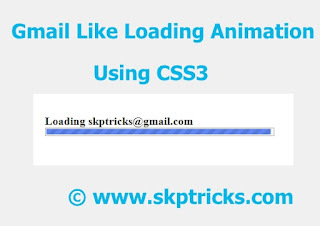 In this post, We are going to provide a small example and source code for "Gmail Like Loading Animation Using CSS3". 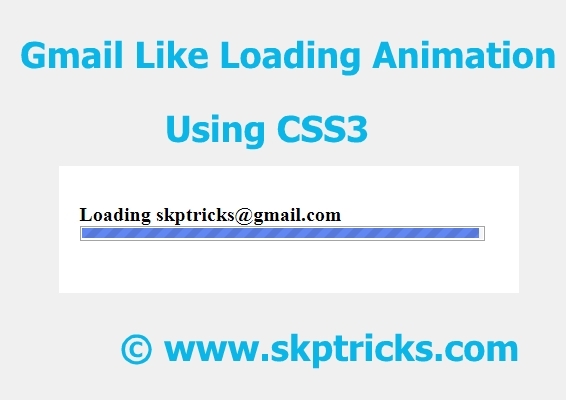 For displaying loading and animation effect , CSS3 Plays a most important role over here. All the animation effects are controlled by Keyframes Rule. Here we have used two keyframes, which provides you smooth animation effect. This keyframes rule provides smooth transitions between two or more specified colors (Dark and Light Blue color) with help of CSS linear-gradient attribute. In another word it provides animation effect between two colors from left to right. Display the gmail like animation effect. This stylesheet provides a smooth animation from left to right. This is all about gmail like progress loading animation effect. In case you have any queries please do comments in comment box below.